I have been following Southend Carnival, an event that takes place every August, ever since I was a child, although strictly speaking I have only attended as a child, with my own child or if I have other children in tow. But I have never been part of the Carnival procession, that is until yesterday. Some of the folk I work with in Street Spirit, an organization that tries to help the homeless and vulnerable, thought it a good idea to have our own float, and I agreed to help out, not knowing quite what I had let myself in for. Going back sixty years, I recall the Carnival was a rather grand occasion and probably for us children the highlight of our summer. Besides the parade in the day that occupied a longer route than present, there was a torchlight procession, a fair and accompanying shows (I seem to recall my dad entering me and my sister in fancy dress costumes). I well remember my mother taking me and my sister to Leigh Broadway an hour before the procession was due to pass in order to get a good viewing spot. There were crowds along the whole route. I recall throwing my pennies and picking up freebies and being well entertained. I recall several bands and then there was the Carnival queen as well as carnival queens from other towns. 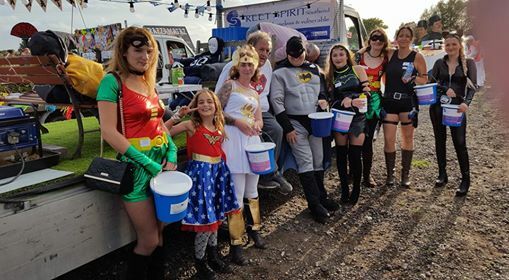 There was magic, mystery and lots of fun and while I may not have been too aware of it at the time, the carnivals did a good deal to promote the charities that took part and raise money. As I reflect on those childhood memories, I realize while things have inevitably “moved on”, many of those early elements are still in place. Maybe the carnival event has descaled somewhat, the route is shorter and there is now only the evening procession, and sadly now no carnival queen, but as I found last night it continues to be worthwhile occasion that is enjoyed by many. While I could observe only some of what was going on around me, my focus was on our own operation and playing my part in it. I was given the task of being on the float and feeding the homeless (two dummies), but I was able to convince a few passers by and wave to many more, including spotting a number of old friends along the route – all of which was great fun. The rest of the team were collecting money and giving out freebies and high fives, dressed in super hero costumes. All in all, it was a happy occasion and one that I feel we would do well to repeat. I was conscious around me there were veterans of many of carnival who clearly also thought this was something worth doing. This was not something a short while ago I had given much thought but it was one of those times I was glad to have been persuaded to take part and all credit to other team members for having the vision and doing some of the hard work needed. It was good to see many entering into the spirit of the occasion and having a good time, despite cold and wind. Bringing together our increasingly diverse community, raising the profile (and money) for the many different charities taking part has to be a good thing. Great expression of past and present ….i was down there working with two of SBC regulatory officers and had a behind the scene look at the crowd safety aspects. Saw our Mayor Judith working hard and clearly loving every minute. So, hope it made all feel good and positive.